Well, Tootsie and I got up at 5 o'clock again this morning, but at least we got some good sleep. She hasn't been feeling so great the past two days, but so far this morning, she seems okay. My heart just breaks when she does not feel so good. Poor baby can't even whine like Mommy. But no matter, we spoil her anyway. Yesterday, the weather was just crazy here. One minute I look out and everything has a light, white coat of snow on it. Next minute, the weather has taken a break and is doing nothing. Just a little left over wind blowing. Then within the hour, I hear raindrops going pat, pat, pat on the metal awning over my living room window. An hour or so later, the pat pat pats are getting much sharper. I look out my window and for goodness sake!!! There is hail bouncing all over everything. You know folks, this is what they call traditional New England weather. The saying goes "If you don't like the weather, wait a little while and it will change." 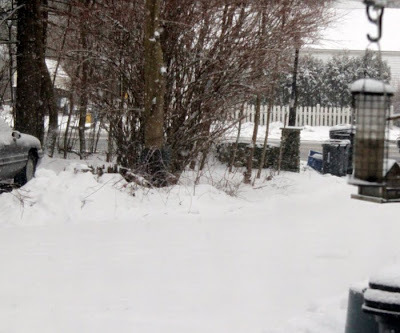 To my friend, Nani, I would be ever so grateful if you really could hold off the snow for just another day or so till my plane could land in Florida. I think I really need this vacation. And you are just the sweetest person to offer to do such a nice thing for me. Of course, I know we can't change the weather, but it's such a lovely thought. Now I have a humorous story for you. Late yesterday afternoon, after the weather decided to take a rest, Moo drove me around to do my errands. I got all our meds, and stocked up on all of Tootsie's favorite doggie foods and treats. For Christmas this year, I got quite a few gift cards, one of which was for Walmart. I had already used it, but there was still some money left on it. So when the cashier finished totaling my order, I handed her the gift card and told her to use this up first, and I would pay for the rest. No problem!! Well, first, the card would not go through. For about fifteen minutes, people behind me were being sent to other registers while we waited for a supervisor to come and help the cashier. After several attempts to make the card go through, a supervisor finally arrived and got the card to work. And I got all of my $0.02 credited toward my purchase. Now doesn't that beat all? I felt so bad for that poor cashier for putting her through all of this for just two cents. Now I'm wondering why did anyone ever leave the darn two cents on the card in the first place? I will have to pay more attention to things in the future. I felt bad for Moo too, because he was standing there with me through this whole embarrassing situation. There probably won't be a post tomorrow morning, because I hope to be on the road early. But I do have a freebie for you today. Today you get the Fire Opal QP. My favorite color is orange, so you just know that the Fire Opal is one of my very favorite gemstones. And it is gorgeous too!! 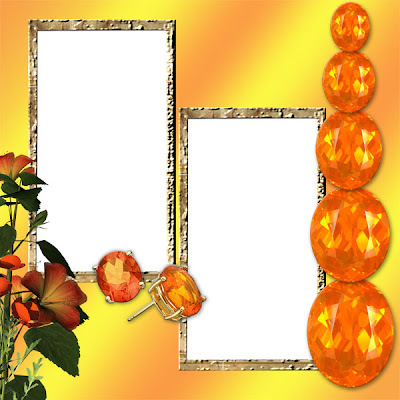 "QP - 012 Fire Opal"
Here is your download link for "QP 012 - Fire Opal"
It's 5 o'clock in the morning, and Tootsie and I have been up for a couple of hours. This is crazy! I definitely have to get back to a regular sleeping schedule. Too many daytime and evening naps is okay if you don't work or have no where to go, but it's time to get back on schedule. I expect to be back to work in a few weeks. I'm on my feet for hours at my job, so I want to be healed before I go back. The good thing about being awake so early is that I got to watch some fantastic snow boarding on TV of the winter games. Those young people were just fantastic. 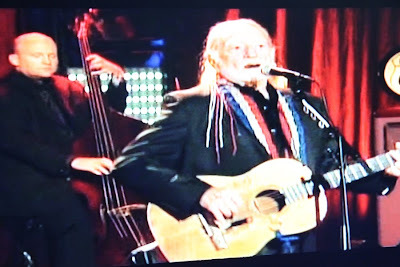 Right now, I'm watching a special on PBS featuring Willie Nelson singing. This man is a country music icon. Here are a few shots I got off the television. 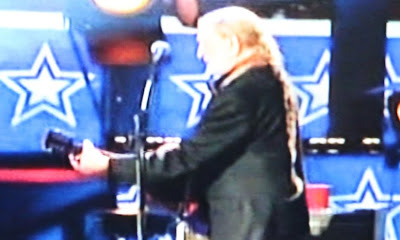 The last picture shows that long reddish blonde braid of his that hangs below his waist. Wow!! Willie Sings "Dream Of Me"
I confess these are not the greatest photos, but it's fun taking them. His show is over now and Clifford The Big Red Dog is on TV, and no, I won't be taking photos of Clifford!! Today, I have a few errands to do, stock up on doggie food, mail parcels at post office, pick up meds, etc. When I get home, it will be time to do some serious packing. I have some things ready, but I need t0 get it to the "almost done" point. I also have to set out Tootsie's meds for two weeks to make it easier for Moo. Daylight is peeking over the trees now, and I am off to have a cup of coffee. Y'all have a fantabulous day now. Oh Goodie! A New Toy To Play With! Well, here I sit waiting for the bad weather to get here. The sooner it gets here, the sooner it goes away and my plane will take off okay on Sunday. As for the foot, we are learning to tolerate each other. Well, not really, but we are trying. Yesterday morning was quite an experience as Tootsie and I made our way from the house to the car to the hospital and back again. It was pouring rain, and I was trying to carry her, my purse, an umbrella ( closed, of course) my purse and my car keys. Once we got out in the rain, I dropped my keys. By the time I was able to pick them up, I was thoroughly soaked. Eventually, I did get Tootsie to the car and into her car seat. Next I got myself back around the car and inside it too. By now I was all out of breath so it took about ten minutes to get my breathing back to normal. (I have wicked asthma) At the hospital, I got soaked again trying to set up Tootsie's stroller and getting her into it. Needless to say, when we got home, I called for Moo to come out and carry Tootsie into the house for me. He also drove us later for her afternoon appointment. Don't get me wrong, I am not complaining. But it is fun to whine now and then, and get babied a little bit. I also had a nice surprise yesterday afternoon. The lens that I have rented for my photo shoots in Florida was delivered. Wow!! This thing is HUGE!!! And HEAVY!! Thank goodness my new backpack has a handle and wheels! This is where that lens will have to live. I set the lens and camera up on the tripod to try it out, but there is really nothing to photograph outside my window at the moment. 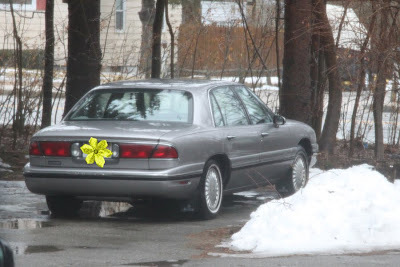 So I took a picture of one of the cars in the front yard. 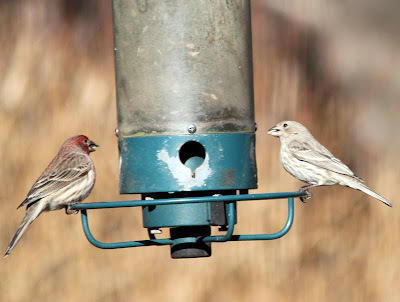 The zoom was only at 200mm, but you can get the idea of the difference it will make. 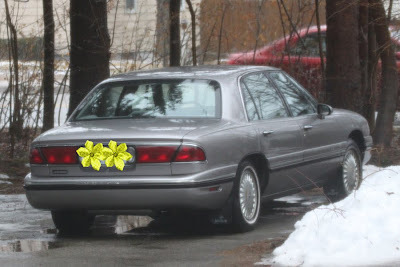 I placed little flowers on the license plate. The first photo is with my regular lens, and the second one is with the rental lens. I can't wait to really try it out. Well, that's it for this morning. I have to get dressed and keep an appointment at the nail salon. My nails have been neglected terribly these past few weeks. Till tomorrow, Y'all have a wonderful day. Proud To Be A "Lady Of The Forum"
Tis a cold wet morning here in rainy New England. Of course, it's only 6:30 am, and the rain may be changing to snow at some point today. Not really a fun day to go out, but Tootsie and I have to go out anyway for her chemo appointments. She goes four times, morning and late afternoon for two days in a row. Then she is off for four weeks. Today will be a bit trickier to travel than yesterday was. Crutches and canes do not mix well with rain. Yesterday I started using a cane. I'm not sure yet if it is easier than the crutch, but this is what the doctor suggested I do. 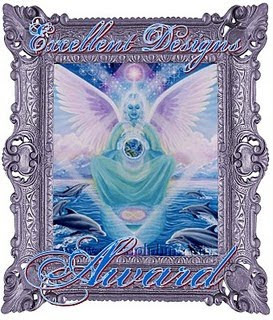 May I share a lovely award that Kyra presented to the ladies of the Magickal Scraps forum for their wonderful Daily Download kits. These ladies do marvelous work, and I am quite proud to be a part of their group. Kyra is also a member of this fine group of ladies. Thank you so much Kyra. It's a real pleasure to work with you. 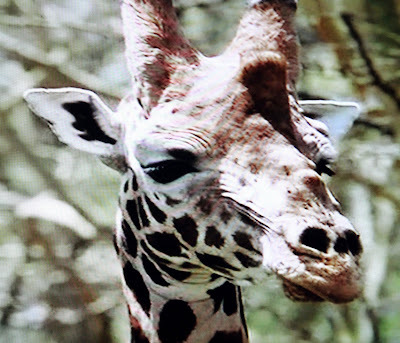 This morning, I have been watching a program about giraffes, and tried to take a few photos from off the television. They did not really come out so great, but I thought I would share a few of them with you anyway. This program was on the Animal Planet channel. Imagine being able to see and photograph these marvelous animals up close? It must certainly be a thrilling adventure. Some days I think, "Oh to be young again. The things I could do!" But then I wonder if I really would have enjoyed such an adventure when I was younger. I seem to recall being quite busy all the time in my younger days. Oh well, it was a nice thought. It's 7 am now, so I think I'll sit back and enjoy a cup of coffee before getting dressed to go out. Y'all have a fantastic day now. Feels Good To Drive Again! Well, it's been an interesting morning. Tootsie and I went to her chemo appointment this morning. It felt good to be driving my car again, although it did take us a bit longer to get there and back home again. It's difficult to carry her while using a crutch, so we used her stroller to go from the car to the hospital and back to the car. It worked out pretty good, just a bit slower than usual. In case you are wondering why I carry her, it's because she can't see very much, if anything. 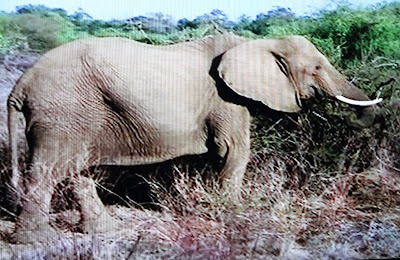 It would be cruel to set her on the ground in strange surroundings, and it's no big deal to carry her. She gets plenty of walking here at home where she knows her way around pretty good. Besides, if she were me and I were her, she would do the same for me. We were supposed to get some nasty weather today, snow and rain. However, it hasn't started yet. We have more snow and rain expected in a few days. I'm just hoping that it doesn't mess up my travel plans on Sunday. This might be my last year to have my condo in Florida, and I'm looking forward to enjoying it. I'm also looking forward to photographing a lot of different birds, and maybe even some wildlife. 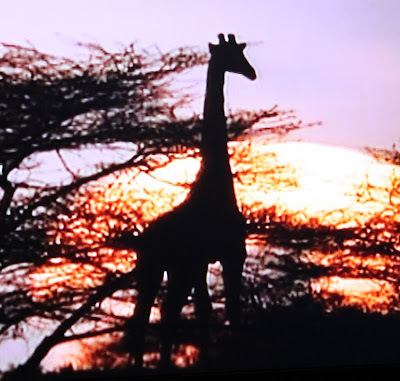 I have never been to a wild animal park, and it would be a real treat if we could visit one. My condo is right next to Disney World, so we just might have the opportunity. A lot depends on how well I can get around. Today's freebie is another gemstone QP. 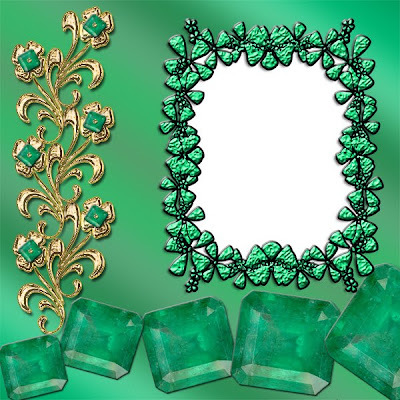 This one features gorgeous, green Emeralds. I hope you can use it. Now I want to tackle a few things on my "To Do" list. Y'all have a fantastic day. And here is your download link for "QP - 011 Emerald"
Good morning!! The sun is shining and it's supposed to get up to about 45 degrees today. BUT, then we have a good chance of getting more snow tonight, and rain after that for a few days. 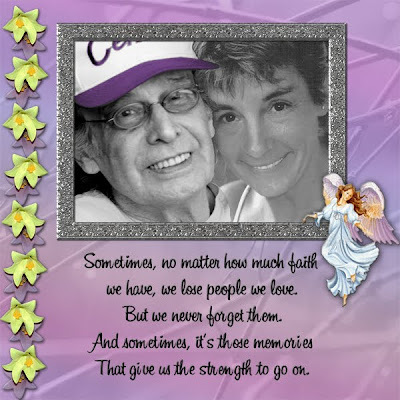 This morning Tootsie and I were supposed to leave early for her chemo, but we did not make it. It was not a good night for sleeping, and then we finally slept too late. Not to worry, we will go tomorrow and Wednesday. Oh joy, our first day out driving and it will be rainy. 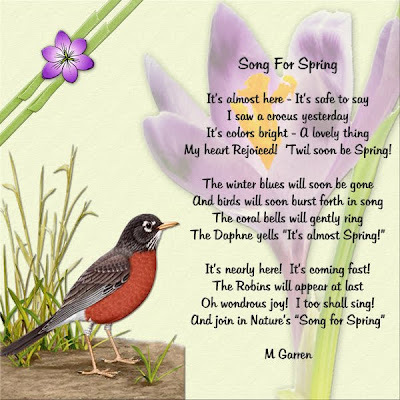 I am watching "Spring Fashions" on the shopping channel. Great news! The jumpsuit is coming back into fashion. Unfortunately, the one they are showing is made of a stretchy knit. Actually, all the new fashions they are showing are made of a stretchy knit. I guess I will have to hang onto my old clothes this year. Wouldn't it be nice if they would use short chubby models for a change? If they did, they would not be using so many stretchy knit fabrics. At least the new shoes they are showing are rather pretty. Oh dear, now they are showing the matching handbag. (It matches the lovely new shoes) It is quite large with both a short handle and a shoulder strap. They have forgotten to throw in a wheel barrow to carry the purse in!! It's huge!! I am at that point in life where large cumbersome handbags are not fun to carry. I have even switched back to a backpack with wheels and a telescoping handle for my laptop. Now there's a great idea for handbags! Just put wheels and a telescopic handle on them, and they can make them as large as they like! The saleslady is now describing the new fabric as lovely, breathable "Slinky." If you are slim, it is quite lovely. If you have any extra pounds or wrinkles, it shows every tiny little imperfection. She is saying how nicely the Slinky material glides over your every curve!! In all fairness, the colors are really lovely. Time to change the channel. 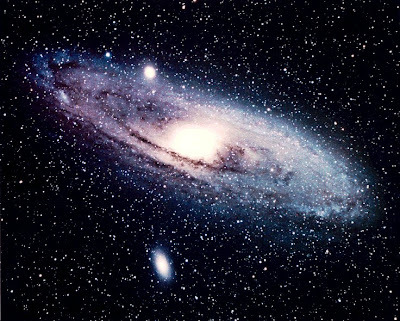 My share photo today is of another beautiful star, Andromeda, who was the daughter of Cassiopeia. My son and his family purchased this star a few years ago to be named for my daughter Kerri. The nice part is that you cannot pick the star that you are purchasing for a name change. And yet, we got mother and daughter stars. So here is lovely Andromeda. Now it is time for me to hobble around behind the vacuum cleaner. Or maybe I won't. We shall see. Till tomorrow, Y'all have a fantastic day. Oh gosh!! Where is the time going? I've been so busy whining about my dumb foot, that the days have been flying by and now I only have six days left to get everything done before I leave for Florida. I know this sounds dumb, but I'm already beginning to miss my Tootsie. But I know that she will be better off here with Moo. Wow, have I been busy with all the new Daily Download kits coming in the next few months. This morning, I finished July and uploaded it to the forum at Magickal Scraps. Now I just have June, September and October to do. Perhaps I will slow down a bit now, although September is almost half done. I'm watching an advertisement on TV for a steam cleaner. It's intriguing because it seems to clean everything including grease. You can use it in the refrigerator, the stove, the microwave, on cabinets and all other surfaces including mattresses and windows. Hmmmmm! This might be good for me. I'll have to give this one some thought! Today I have an interesting picture to show you. I downloaded it from a web page at http://www.nasaimages.org/. 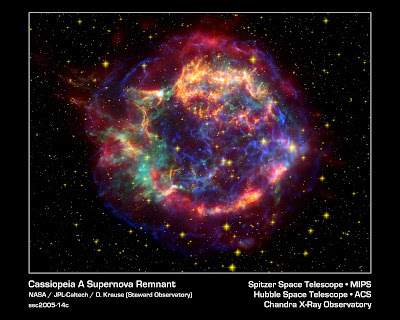 This is a picture of Cassiopeia, the star that my hubby had named for me for Christmas quite a few years ago. This is such an interesting and colorful view of this fabulous star. It's almost time for me to make lunch for Miss Tootsie and myself. Till tomorrow, Y'all have a wonderful day. 29 Days Till Gorgeous Spring!! Oh wow, Florida is only eight more days away. I can't believe how quickly two months has flown by. Also, Spring is only 29 days away. Woo Hoo!! This cold weather is finally going to give in to warmer temperatures and blossoming trees and flowers. A truly beautiful season indeed. Moo is beginning to feel a bit better, but now Miss Tootsie is sounding a bit stuffed up. Even our furry babies catch our colds and illnesses. I feel so helpless when she is not feeling well. If she doesn't sound better by tomorrow, I will call her doctor to see if we can get some medicine for her. I've been practicing with the new boot cast, but I seem to get around better with just an ace bandage, the old boot and one crutch. Of course, this is only around the house. I will have to use the boot cast for traveling outdoors. Next project is to figure out how to make it more comfortable. Hmmmmmm! Pretty soon, I have to start setting aside things to pack in my suitcase. I bought a new backpack with wheels and a handle for my laptop and camera. My old backpack is starting to get too heavy for me to lift all the time. I take it with me everywhere I go, so it's probably why I fell on the ice last weekend. No more falls! Last night I finished up two months of Daily Downloads and got them uploaded to the forum at Magickal Scraps. What a great feeling to get ahead of myself for a change. I also made a new QP for you. This one was so much fun, and is quite whimsical with little ducklings. Credits for resources go to Aussie Scraps, Delicious Scraps and BAZ. Now I'm off to see what kind of mischief I can get into today. Y'all have a fantabulous day now. And here is your download link for "QP - 010"
If you have any problems with the link, let me know and I will re-post it. Blogger doesn't me copy and paste the links, so I type the link in. Today is windy and cold with bits of sunshine peeking through the clouds. It's a good day to stay inside where it is warm. Moo is starting to recover from a nasty cold, thank goodness. As for my foot, it has turned all sorts of purple and red colors, so I guess it's going to heal too. It's still a bit swollen, but that too will pass. Yesterday, my daughter Deanne and her family came by for a really nice visit, and we all had pizza's for supper. What a nice way to wrap up my day. I tried to talk Jasmine (my grandaughter) out of her championship cheerleading jacket, but she was not feeeling quite so generous. LOL. She is very proud of her new jacket, and rightly so. I'm very proud of her to0. Last night, I spent some quality time working on the upcoming Daily Download kits, and have two months almost finished. What a great feeling to be getting ahead of a few things! Tonight I hope to finish up these two months, and start another. We have picked our months for the next six months. Mine is September, and I already have a few things done for it. I also try to keep up with some of the challenges too. 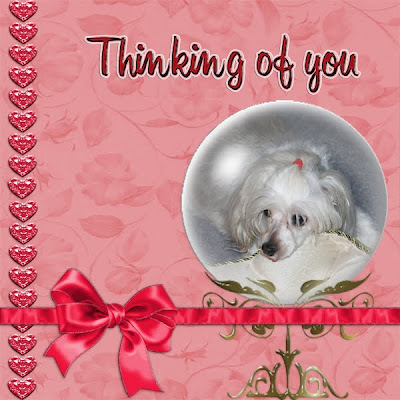 This month, Snowy gave us quotes having to do with the heart, feelings and life. Here is my layout for this challenge. Now it's time for me to make lunch for Miss Tootsie and me. Till tomorrow, Y'all have a fantastic day. 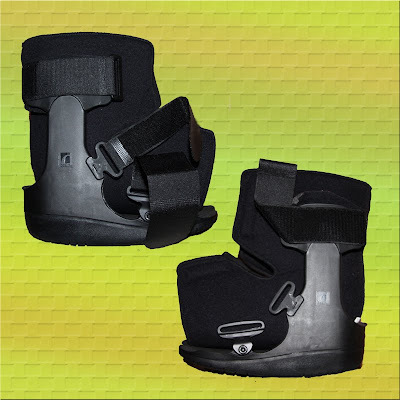 This Boot Was Made For Walking! It's looking a bit windy and cold outside my window. There's even a bit of sun trying to shine through. But I am staying indoors today. I have this "marvelous" new boot cast to try to get acquainted with. Yesterday, when the doctor put it on my foot, I tried walking a bit with it, and it actually felt pretty good. So I thanked him, and Janet (daughter in law) and I went home, where I promptly took off the boot and got comfy on my sofa. All was well in my little world, knowing that I would soon be getting around quite well. But when it was time to put the new boot back on, Oh Boy!!! I struggled with it, but I could not get it on without help. The beauty of my new boot cast has just lost it's glow. Here's a picture of my new boot. Now that I'm seeing it on paper, it doesn't look so pretty. Actually, it's quite homely. There'll be no tip toeing through the tulips wearing this contraption. It will be more like stomping down the birdie trail!! Ah well, it's time for me to stop my whining and practice putting it on by myself. It's time to get Tootsie's meds now, and maybe have another cup of coffee. Till tomorrow, Y'all have a marvelous day. Moo was busy shoveling yesterday, and today is not feeling so well. He says his throat is a bit scratchy. Oh dear, I hope he does not get very sick. We are like the blind leading the blind here. Man, woman, dog - all hobbling about tending to each other!! 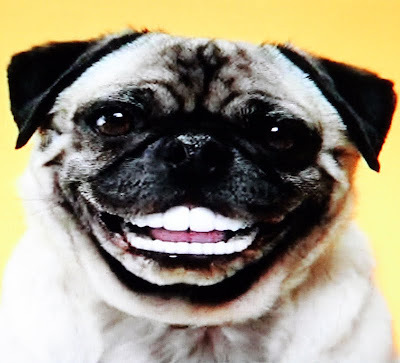 I'm sitting here wondering what I am going to use for a picture to share today, when one of my favorite TV commercials comes on. 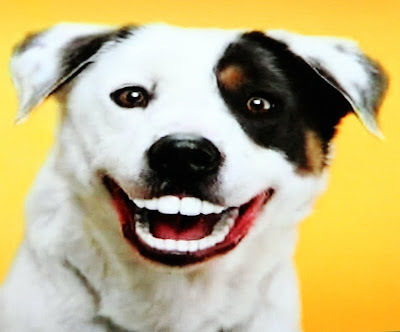 This ad is about doggie dental treats, and features doggies showing off their "Doggie Dentures." I photographed them right off the television. You just gotta love these ads!! At the same time, the animal shelter ads that they are showing on the TV are breaking my heart. If I could, I would gather up all these poor babies, and bring them home with me. Now I have to start getting ready for my doctor appointment. I am a slow mover, so it takes me a while to get dressed. Till tomorrow, Y'all have a fantastic day. Gosh almighty!! I looked out my window this morning, and there it was! That white stuff falling from the sky again! I took a picture of it to share with you. You mean you didn't ask for more snow photos? Oh well, it's called "too bad Harry!" Other than my odd looking foot, that's all I have to photo right now. As I look over toward my window, I can see that the snowflakes are getting bigger and are coming down much faster now. Here was the view about 20 minutes ago. I have to call my doctor this morning for an appointment to get my regular cast put on. Now I will probably need a sled to get there. Can't you just picture it? Me hopping along in the snow with my crutches? Oh my! Last night I was able to finish up my contribution to the April daily download kit. I suppose one might call this the brighter side of being laid up. I now have quite a lot of time to play on the computer and design. That is, when I can stay awake and concentrate!! Yesterday, one of the dwarfs did me a favor and went to the market to buy a gorgeous great big fat lobster for Moo. Seems we've been keeping Moo pretty busy lately, so thank you Moo! The latest news on Howie is about the same. He is still at the VA hospital and doing just fine. I think maybe all of the nurses have lost a few pounds chasing after him all day long. Our Howie is quite a character. You gotta love him, but he does drive you nuts! I'm off now. Time to give Tootsie her meds, and take mine too. Y'all have a fantabulous day now. Good morning. It's a rather drab gray President's Day here in the U.S.A. but I don't mind. My brain is a bit fuzzy and warm, but my foot is not hurting so much. God bless pain pills when you need them!! They also helped me get some good sleep during the evening and the night. I want to thank everyone for all the nice comments and emails. It's a beautiful feeling to know that so many wonderful people care and take the time to let me know. It puts a huge smile on my face. So thank you, thank you from the bottom of my heart. I also want to say WELCOME BACK MY FRIEND to Crooknees. I'm so glad to know you are feeling better now, and want you to know that you have been missed. Tootsie sends you a woof and a lick too. Once my pain pill kicked into high gear this morning, I hobbled on into the computer room and grabbed us a freebie from the PC. Don't you just love thumb drives? I do! My favorite one is a 16GB cutie that Audrey gave me. I just pop the freebie on it, and then slide it right into the laptop. Right now, I'm going to post your freebie and take my leave. My eyelids are getting droopy, and it's getting difficult to concentrate. Till tomorrow, Y'all have a fantastic day. 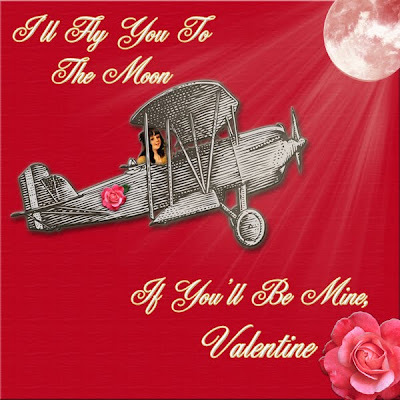 And here is your download link for "QP - 009"
Happy Valentines Day everybody. It's 4:45 in the morning, and I thought I would chat with you a while in case I drift off to sleep again. Sleeping is good today. While I sleep, I don't hurt. Pretty soon, I have to get up off this sofa and let my Tootsie go potty. But that is painful, and I am trying to wait a while if she can. Confused yet? Last night as I was leaving to go to work, I slipped and fell on the ice and broke my left foot. I didn't know it was broken, and still tried to go to work. I drove to a pharmacy to buy some Ace Bandage, but could not walk when I tried to get out of my car. I called work to say I wasn't able to to get there, and drove home. I also am very thankful for all my dwarfs. They showed so much concern, and helped me a lot. It's not pretty watching someone my age trying to walk, or better yet, climb stairs to get in the house when you can't put any weight on your foot. Ever tried hopping up stairs? At 40, it's an inconvenience. At 70, it's downright daunting. I feel so helpless, and am so thankful that I am not completely alone here. I just feel bad for my little Tootsie. It takes me a long time to get around to tend to her. But she is so patient with me. She is funny though. She absolutely hates crutches. At times, when a couple of the dwarfs have had to use them, she would bark incessantly at them and try to chase them. With me, she is very protective, and does not mind my crutches. I'm supposed to be using the walker they gave me at the hospital, but you need to be able to put both feet on the ground to use the walker. Maybe in a couple of days I will be able to use it. Meanwhile, my trusty old crutches will have to do. 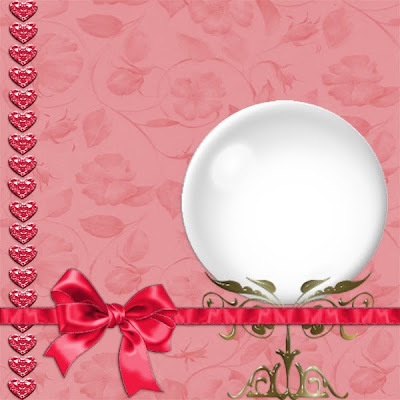 Today, I had a Valentine freebie for you, but it is on my PC (I am in the living room using my laptop now), and it is too much of a project to try to get to the computer room to get it. I will try to have it for you tomorrow. 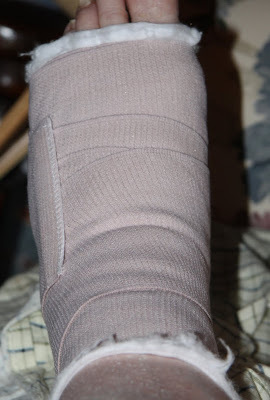 I do have a photo of my broken foot to share. That's it for today. My foot is throbbing, and I am watching the clock till it's time for another pain pill. Hopefully, I won't need them after today. Till tomorrow, Y'all have a wonderful day. Yesterday was a busy day, trying to finish up most of the tax project. Thank goodness for my wonderful daughter in law. Without her, I would be a basket case by now. I just have to transfer totals to the tax forms, and gather up a few bank statements. Phew!!! We had a regular heat wave here yesterday. The temperatures got up into the upper 30's. Today is supposed to be more of the same. Time to dig out the shorts!! Last night was chat night at Magickal Scraps, and it was another fun night with the ladies of the forum. Sad to say, Kyra was missed. Poor thing had taken a nap, and did not wake up until 2 a.m. But that's okay because it meant she could stay up to watch the Olympics on TV. Not much happening yet in the design department here. I did manage to make a valentine for a friend of mine. Now I just have to package it up and send it off to her. Have you noticed? Or is it me? Did Valentine's Day sneak up on us rather fast this year? If I'm not careful, Summer will be over while I'm sitting here waiting for Spring. LOL. Here's a peek at my Valentine. Well, that's it for today. I have things to do here before I leave for work later. Y'all have a wonderful day now. Hot Dang!!! The world is white this morning, but we did NOT get a ton of new snow. We ended up with maybe six more inches altogether. However, the wind was something else! For hours and hours, it huffed and it puffed and it blew everything all over the place. It also made the driving visibility quite poor. My house is surrounded by very tall pine trees, and they were bending and swaying in the wind. It makes you a tad bit nervous to see something that big bending and swaying so close to your house. You never know when one just might come down and land on your roof. Oh dear, let's not even think of that!! At the moment, I am taking a short break from my taxes to bring you a new freebie. Then I must hop right back to the dungeon desk and finish up my dismal tax task. You would think that at my age I would have gotten used to doing this every year. But not this wimpy old gal!! I'd rather scrub the floor. 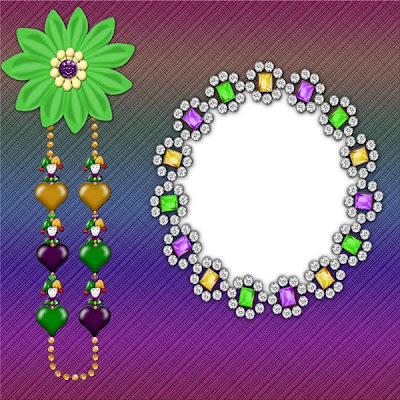 Today's freebie is a Mardi Gras QP with lots of fun color. Now I'm off to make lunch for Tootsie, and finish up my gruesome task. Y'all have a fantastic day now. And here is your download link for "QP - 008"
Don't Look Now, More Snow Is Coming! Oh Oh, more snow coming today!! They're forecasting a big one for us. 8" or more today, and another 5 or 6" tonight. Even a little bit more for tomorrow. Now I have a different TV channel on, and they are forecasting even bigger totals for the snow. Snowy??? Want any of this white stuff?? If I could send it all to you, I would. It looks like we're getting even more snow next Monday and Tuesday. Yish!! I'm watching the news, and it says that all major airports along the Eastern coast are closed. Even though Florida is enjoying some better weather, the planes can't get out to fly there. Oh please, please, be nice weather when I'm ready to fly South. Well, Janet came over yesterday a bit late in the day, and stayed till very late at night. Let me say, she did a marvelous job of getting my paper work in order. No, it's not done, but the worst part is. Thank you, thank you, Janet. I will spend today going through all my receipts, and my checkbook. Oh, woe is me! I'd rather be playing on my PC. I did not play on the computer at all yesterday afternoon and night. It doesn't look like I'll get to play much on it today either. But I can see a light at the end of the tax tunnel. So that's a good thing. 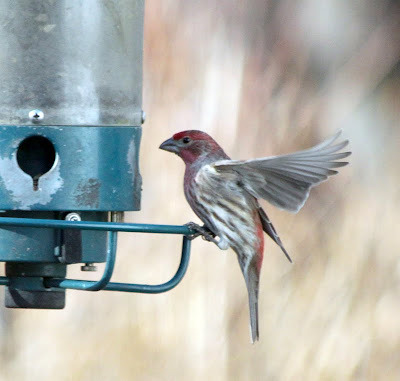 Today, I have some more bird photos to share. 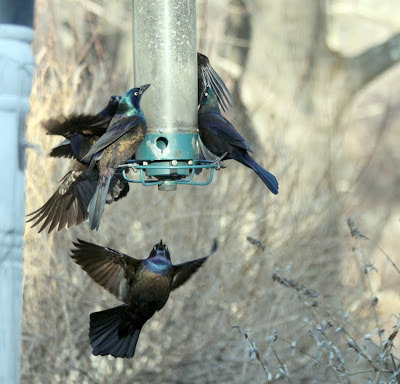 There were so many different types of birds at the feeder this past Monday. 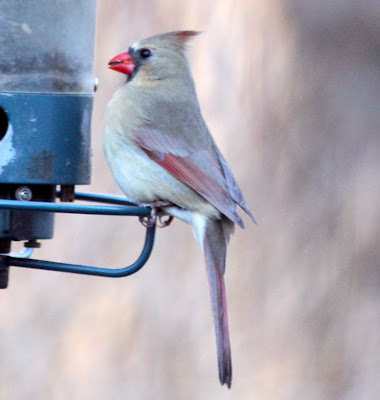 Here are photos of Mommy Cardinal, and some Finches. Now I have to get busy and pay a few bills, then attack the piles of 2009 receipts. Oh I just know this is going to be a wonderful fun day!!!!! LOL. Y'all stay warm and safe, and have a fantastic day now. Just 20 Days Till The Plane Leaves! Today is D-Day!! Janet is supposed to be coming by to help me with my taxes. Oh joy! Oh joy! This must be the reason why I don't like the winter. Winter means cold weather and taxes. Oh well, maybe after today I can breathe easier. It's not the paying part that I don't like, it's the organizing everything and hanging on to it all year. I really don't know why that bothers me, but it does. So, today's post will be short. I have some laundry to get started before my daughter in law gets here. I may even treat myself to a second cup of coffee. Get the adrenaline going! Now I have some new photos to share. 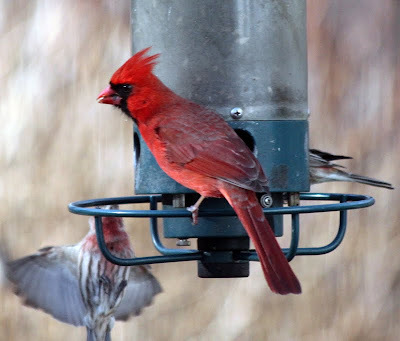 Today I 'll post the Cardinal. 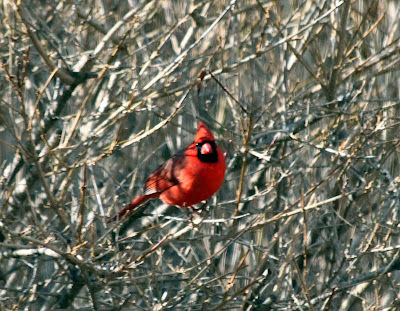 He's a gorgeous bird, and his color is quite appropriate for February. Pretty soon here, I have to decide which lens I want to rent to take with me to Florida. I'm thinking the 100 - 400mm. Hmm! Maybe my friend Mary Ann can help me decide. She and I are hoping to do some bird photo shoots there. There are some beautiful parks and botanical gardens in Florida just waiting for us to show up with our cameras. Speaking of Florida, there are only 20 more days till the plane leaves. Do I sound anxious? You bet!! The warmer temperatures are going to feel wonderful on these old bones. And you know what else is nice about it? Spring will start about six days after I get home from there. At least on the calendar! I'm off now. Miss Tootsie needs her meds, and it's time to start the laundry. Y'all have a fantabulous day now. Red Is A Fantastic Color! This morning is beautiful, bright and sunny. It's still quite cold though. Only about 20 degrees (Fahrenheit) at this time. There are still large chunks of snow sitting where the plows put them last week. It has to stay above freezing for a few days to get rid of it all. I thought I might get some new photos this morning around daybreak, but no such luck. Not even a field mouse was out back looking for food. Maybe later. I did get to work on a new layout that I will turn into a new QP. This month, we need to show lots of red. Red is a great color for lovers, and for a healthy heart. A lot of places have been giving out free stuff to people who show up wearing red clothes. This is to promote good health for your heart. A quick look at my wardrobe tells me that I need to do some shopping. I have no red clothes!! Maybe I can get me a red hat. I love those big floppy picture hats. Maybe when I get to Florida, I can get me one. It will be great for keeping the sun off my face. I also want to visit a couple of flea markets when I get there. They have some great buys on purses and travel bags, and I want to look for some. Now it is time for me to get busy here. I am still at work for about another six hours. Then I am off till Saturday night. Oh boy!!! Y'all have a fantastic day now. Most of yesterday's snow has gone, and today is sunny and cold. Very cold!! I do feel bad for those folks further south who got tons of snow, although some of them are turning it into fun. On television this morning, they are showing thousands of people enjoying a good old fashioned snowball fight in Washington DC. Travelers aren't faring so well though. A lot of flights have been cancelled. I just hope the weather will be good when it is my turn to travel. I don't relish the thought of spending a day or two hanging around an airport. Remember the new teleconverter that I recently purchased? Well, I've decided to return it. I had a chance to take a lot of photos with it, and they were not as good as I had hoped. 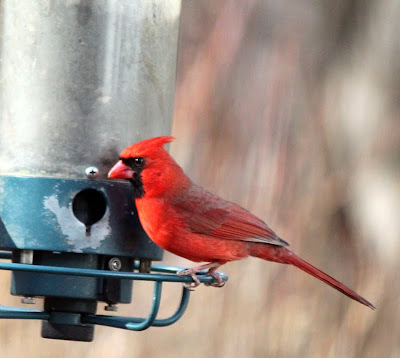 I think the only way to get the bird photos I want will be to invest in an expensive telephoto lens. Maybe I can rent one first to see if I really want to buy one. Santa? Can you hear me? Already I'm making up my list for next Christmas! Tootsie and I slept late this morning, and it is already almost time for lunch. 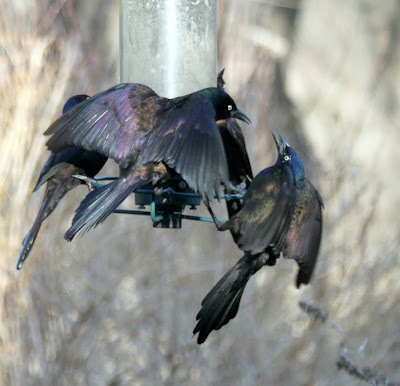 Before I leave you to whip up some food for us, I'll share some more of my Grackle photos. 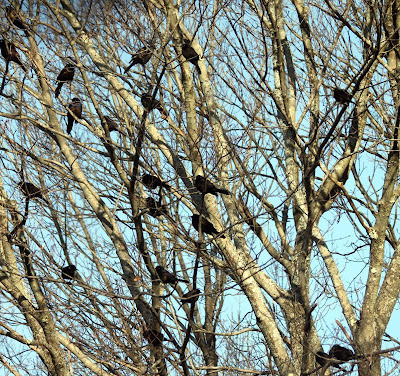 The first photo shows some of them waiting in the trees for their turn at the feeder. 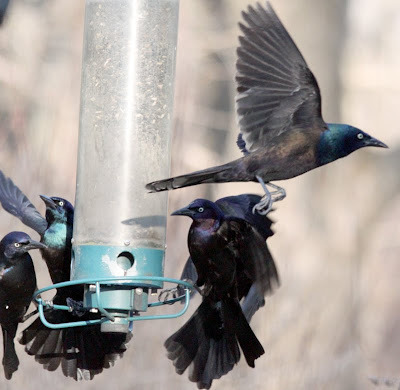 Okay, that's it for the Grackles. Tomorrow I'll see if I can get some new photos. Now it's time to feed my little girl. Y'all have a great day now. Guess what it's doing outside my window this morning. Sunny? No. Raining? No. Snowing? Yup!! I'm thankful I'm not further south with another two feet of snow, but enough is enough!! This morning looks to be only a small amount coming down. But later today, we'll have a better idea of how much we're going to get this time. Yesterday, I happened to look out the window at just the right moment. 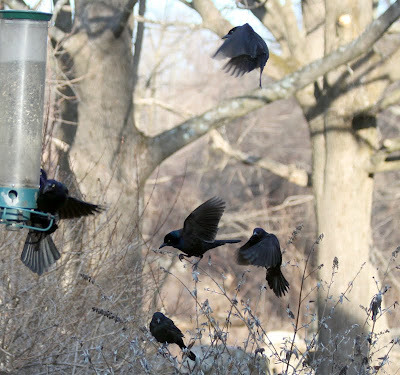 Hoards of Grackles were flying down and zooming in on the bird feeder in the backyard. 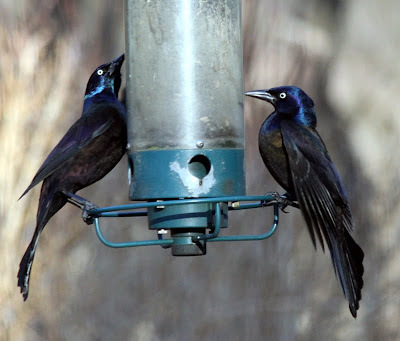 (At least I think they were Grackles. 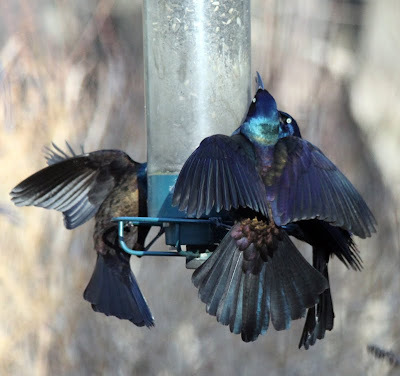 I looked them up in my bird book.) 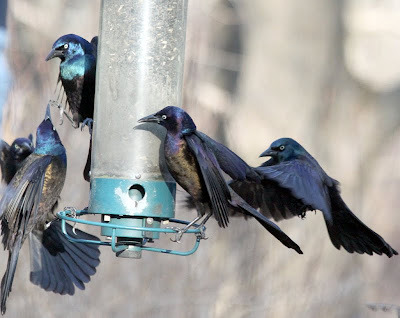 Up to now, I've only seen them in small groups. This time, there must have been a couple of hundred of them. Naturally, I had my camera on continuous shoot, and got tons of photos. Today, I will share four of them and save the others for another day. Amazing!! It took me over an hour to finally decide which four photos to post here, and it only took me a few seconds to upload them to the post. How about some good news? Yeah-h-h-h!! We have hot water again! Yesterday, my son-in-law Eddie, who is an electrician, came by and fixed the problem. Seems the hot water heater wasn't hooked up properly. Thank you, Eddie. We don't realize how much we rely on having hot water until we don't have it anymore. I'm off tonight, and my Tootsie is quite pleased with that. I have to say that she was not so pleased last night knowing that she was getting a bath now that the hot water was fixed. But she lived through it! Uncle Moo, on the other hand, was glad to have his room smelling fresh again. My Tootsie's gassy fumes just about drove Moo right out of his own room Thursday night. Seems he had to open his bedroom door and turn on the fan to blow the delightful aromas out of his room. Atta girl, Tootsie!! Now I shall leave you and make myself a nice hot cup of coffee. Y'all have a fantabulous day now. Six More Weeks Till Spring!! Only 43 more days till Spring!! Hip Hip Hooray!! Here I am getting excited about it, and the Mrs. reminded me that last year was a very wet Spring. Well, that may be true, but at least it was warmer than Winter. This morning is quite sunny, but cold. Only about 18 degrees (Fahrenheit). Br-r-r. The Mrs. also told me that yesterday, there was a herd of about fourteen deer grazing on the land next door. Are you kidding? Where are they when I am here with my camera? I've been keeping my eyes peeled this morning, but so far no deer! This will have to be a short post, because the Mrs. will soon be waking and wanting her breakfast. Meanwhile, I have my trusty camera sitting on the kitchen counter near the window so that I won't miss any good photos. See? I am optimistic!! 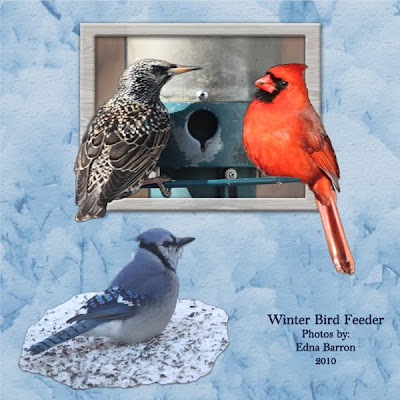 At the moment, there are sparrows, juncos, finches, cardinals and a blue jay taking turns at the feeder. And let me not forget the little squirrel that is out there picking up all the seeds that get dropped on the ground. It's almost time for me to start preparing breakfast here, so let me leave you with a layout that I made to celebrate that Spring will soon be here. Till tomorrow, Y'all have a wonderful day. So far, no snow this morning. The sun is shining and it looks to be quite lovely outside. Mind you, it's still too cold to go out and frolic in the yard. At least for these old bones. Tonight is soon enough, as I have to fill in at work for a sick co-worker. Daughter in law, Janet, has come to my rescue, and offered to come help me with these dreaded taxes. I don't know why I dislike them so, but they actually give me a headache and a bad case of anxiety. If only they could be like laundry. I like doing the laundry. I could do it all day. And I know why I like it. When I get it all done, you can actually see that I did something. As for the rest of the housework, I could work all day, and you would never guess that I had been busy at it. Last night, I finished up another challenge. The "Favorites" challenge this month is about our favorite type of music and why we like it so. 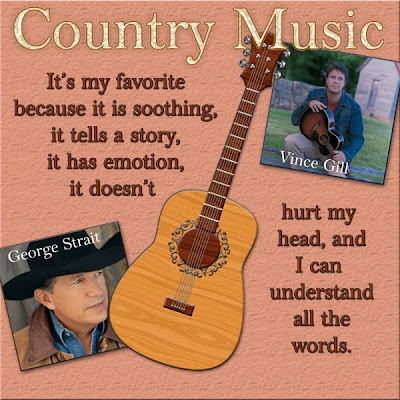 My favorite is good old fashioned country music. I don't like the new hip hoppy-pop rock so called "country" music. Sometimes change is not so good. I believe there is room for all kinds of music without infusing one into another. 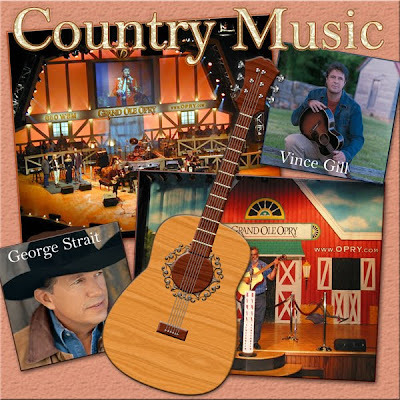 As a child, our home was always filled with the sounds of country music. When "rock 'n roll" came along, I found a second type of music to enjoy. Alas, even that was changed in later years to some metally acid type of "rock." Don't get me wrong, it's good to have so many different types of music. I'm just not thrilled about turning the good old fashioned stuff into a clone of another genre. Now that I have done my "spouting off," let me show you my two page "Favorites" layout. Some years ago, a friend and I drove to Nashville, Tennessee to explore the home of country music. The following year, we went back to spend a week for the Fan Fare celebration. 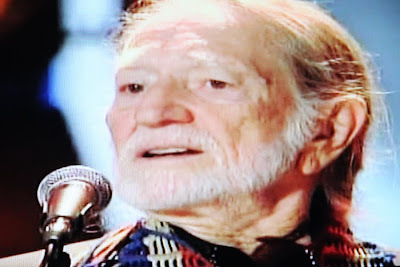 This was when all the big stars came together, and for a week we had lots of free concerts, and up close and personal visits with the country music singers. Naturally, we got a lot of autographs, and had our pictures taken with the stars. While we were there, we even got to visit the Grand Old Opry. Wow!! What a fantastic, heavenly week! Today, I shall check out a link that my friend Mary Ann sent me. It's time to look up where the best places are for photographing Kissimmee's fauna and flora. My goodness!! Only 24 more days, and I shall be basking in the wonderful warmth of Florida. Now I must get ready for another visit from the furnace/plumber repairmen. We have not had any hot water for a few days, and it is becoming not so funny any more. It almost seems like they break something when they are fixing something else so that they can come back again. Of course, this is not the case, but it seems that way. It is time for Tootsie's meds now, too. So till tomorrow, Y'all have a fantabulous day. Oh for goodness sakes!! I looked out my window this morning and there it was!! Big fat snowflakes falling from the sky and covering everything with white. Is February going to be another snowy month? Florida is sounding awfully good to me right about now. Their Winter is like our Spring. I can handle that!! For those of you who want to learn how to do the "OOB" technique (Out Of Bounds), there is a really great website that is chock full of wonderful tutorials. http://www.worth1000.com/. Click on "Tutorials" and look for the little search box at the top left corner. Type in OOB and click. Now have some fun. A while back I made my first OOB project, but then I never kept up with it until this week. So now I am learning all over again. Silly me, this is such a fun type of project. Here is the very first one that I made. 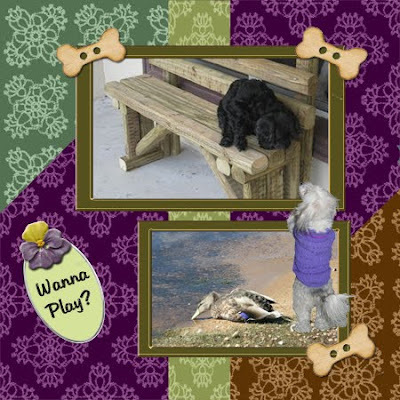 It features Miss Tootsie trying to get to know her cousin Chrisey in Florida. As you can see, I am still procrastinating about doing my tax stuff. I really really do not like it!!! Alas, I am going to have to at least get it started this afternoon. I am so bad! Scrapping is much more fun! 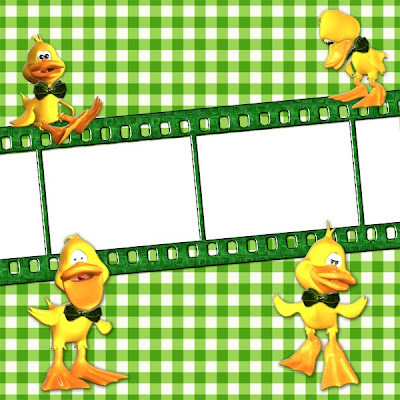 As promised, I have a new freebie for you today. One of the new challenges was to make something with a set of brushes that were made by Kai Princess. (You can find her brushes at http://www.deviantart.com/). I made a teeny little kit called "Fun With Brushes." So now I am going to make lunch for Miss Tootsie, and then do the dreaded thing (taxes). Have fun playing with your freebie, and Y'all have a marvelous day. 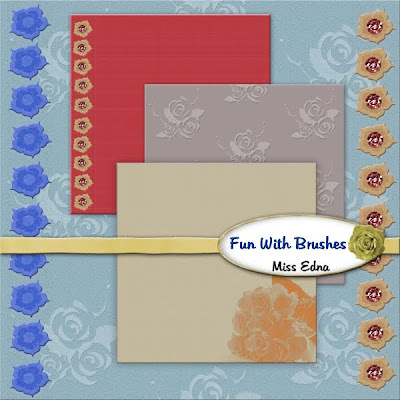 And here is your download link for "Fun Wth Brushes"
Well, today is a bit better for Madam Cranky. 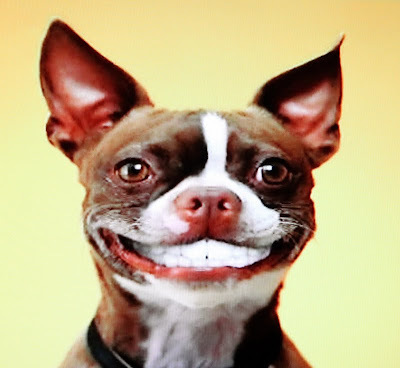 After making a nice donation (paying the bill) to the neighborhood plumber, thereby taking a bit of weight off my wallet, and a good night's sleep, I think I just might be a bit cheerier. That doesn't mean that I am Miss Sunshine yet. I still have to gather up all the stuff for my taxes and put it all in order. Yuck! Yuck! I think if I had to name the one thing I really hate the most, it would have to be doing all this tax stuff. In years past, I would get physically sick over it. But thank goodness, I had Michael to take care of it. Now it's just moi, and I really do procrastinate over it. But my appointment with the accountant is only a week away, so it's crunch time here. Yesterday, I spent a few hours trying to figure out how to do an "Out of Bounds" layout. I did finally end up with one, although I have to say it's not my best. But it will get better. I used some of my favorite photos. The background is a photo of my snow-covered hedge. Today, after spending some time on the tax stuff, I want to start on some of the challenges at Magickal Scraps. Then tonight, I think it's time to defrag my computer. It's been a while, and I really should do it more often. Later this week, I will have another freebie kit for you. Now I must go and make some lunch for Tootsie and me. Y'all have a wonderful day now. Imagine that!! It's already February. Spring is really coming. It's creeping rather slowly, but it IS coming!! And I have only 27 more days till I get to sunny Florida! As for today, this is not a very good day. The hot water pipe in my pantry that was fixed in December has broken again and is spraying all over my pantry. So much for the quality of some of today's plumbers. Moo has shut off my water, so hopefully, someone will be here soon to fix this nasty little problem. I'm getting very cranky today! Gee whiz, I wonder why!! I am really getting sick of constantly fixing things over and over. Okay, Edna, lighten up. Stuff happens!!! Right about now, I can almost smell the warm air wafting up my way from Florida. It is teasing my nostrils and my mind. I really need this vacation. My poor frazzled little mind needs this vacation. Want to see something nice? 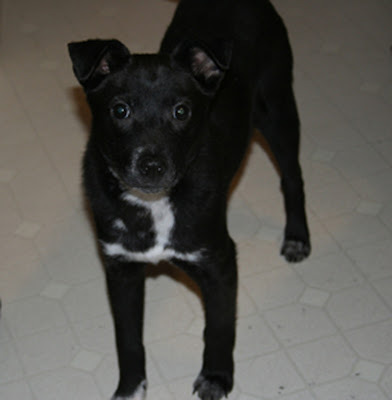 Remember I told you a while back that Mac and Audrey got a new little dog from the animal shelter? Well let me introduce you to "Moon." He is just the cutest little fellow. 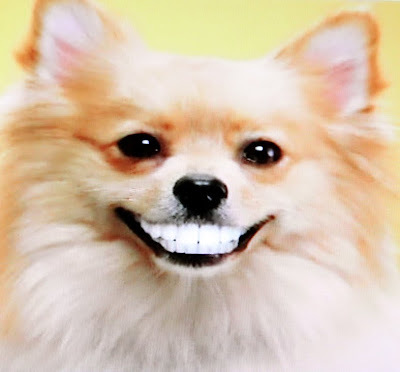 If you're looking for a new pet, this is the way to do it. There are so many abandoned pets that are just waiting for new forever homes. So visit your local animal shelter. You'll be saving a life, and getting a new best friend. Now I shall take my cranky old self off to get some lunch for Miss Tootsie. Y'all have a really fantastic now now.